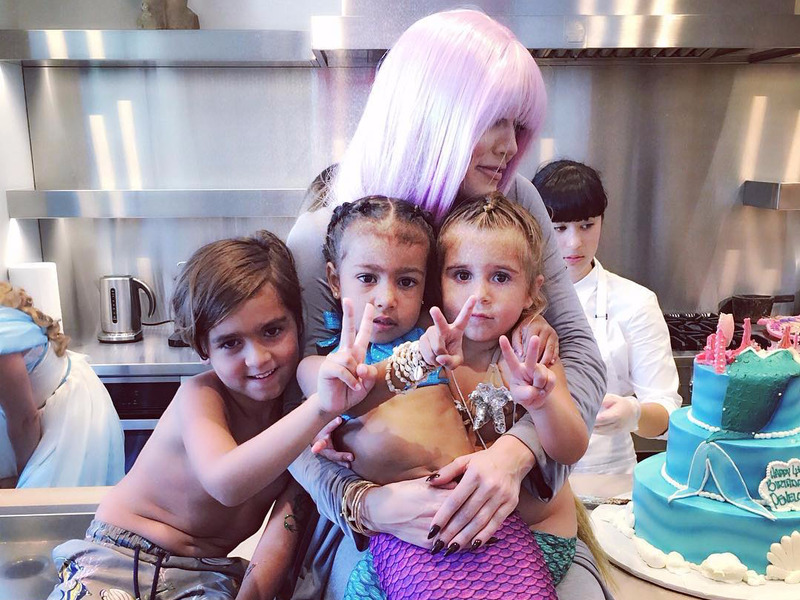 The Kardashian clan went under the sea for a joint birthday party for North West and Penelope Disick. North, the daughter of Kim Kardashian and Kanye West, and Penelope, the daughter of Kourtney Kardashian and Scott Disick, had a mermaid-themed party to celebrate their birthdays, which are three weeks apart. North turned three on June 15, while Penelope will turn four July 8. Both North and Penelope wore sparkly mermaid tails and had individual three-tiered mermaid cakes. The girl’s aunt, Khloe Kardashian, sported lavender as per the girl’s request. When your nieces request you wear lavender hair to their mermaid party. You wear lavender hair. Anything for my babies! There were also two princesses on hand to help the girls celebrate. It looks like the party was a success.